Luo Mu was from Ningdu, Jiangxi province, and lived mostly in the provincial capital Nanchang. He had a reputation for conviviality and his skill at poetry. 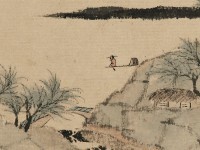 The poem inscribed on this painting, however, is by the famous Tang (AD 618-907) poet, Du Fu (AD 712-770). The original poem, titled Inscribed on the Wall of the Chan Master Xuanwu’s Room , described and praised a mural that was probably painted by Gu Kaizhi (c. AD 344-405). It reads: ‘The red sun shines on the forest of stones, and the river flows towards the sea under the blue sky’. Luo Mu was from Ningdu in Jiangxi and lived mostly in the provincial capital, Nanchang. He had a reputation for conviviality and for being good at composing poetry.